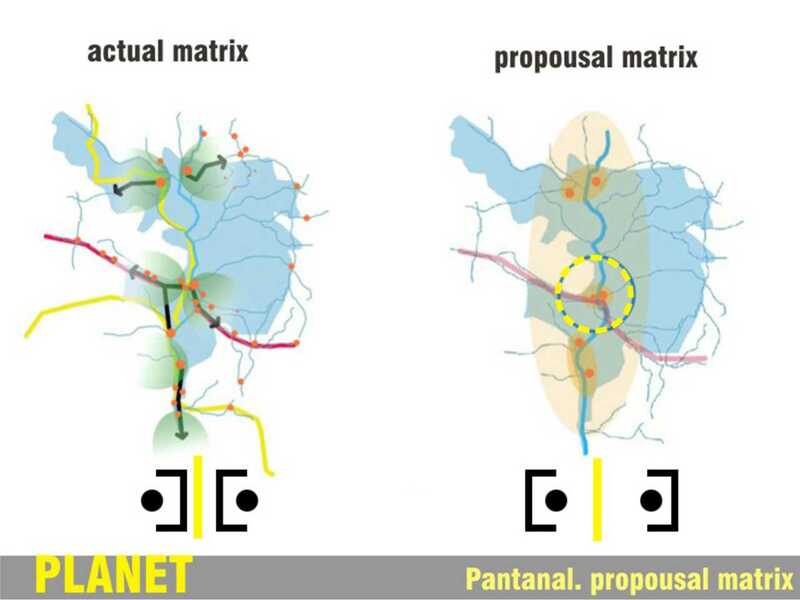 Project entry 2011 - Reinvigorated waterways for transportation and sustainable development, Puerto Suárez, Bolivia: Pantanal matrix. 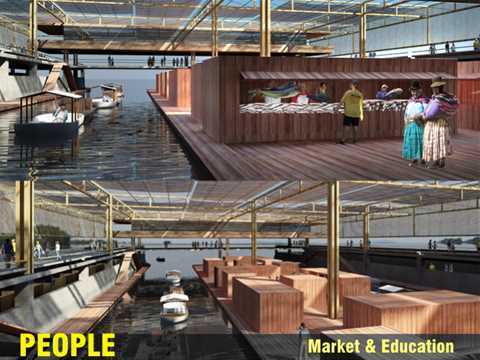 Project entry 2011 - Reinvigorated waterways for transportation and sustainable development, Puerto Suárez, Bolivia: Market. 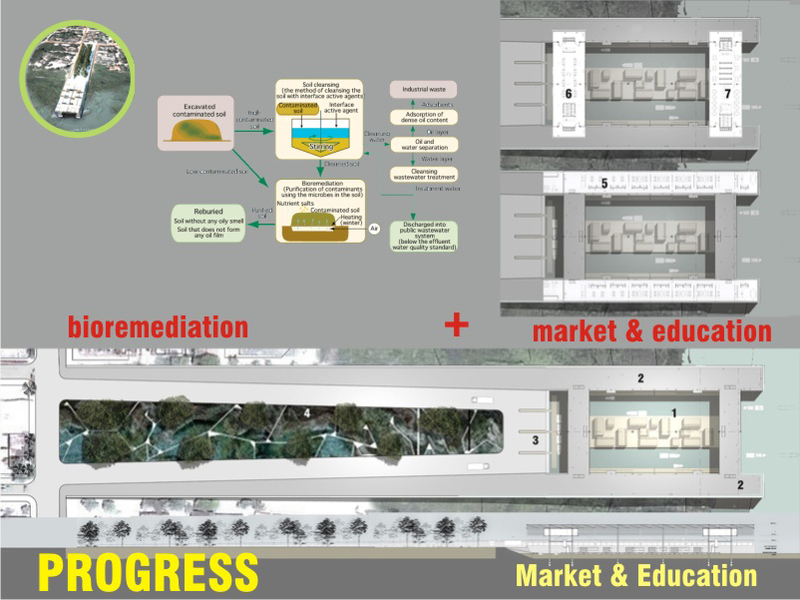 Project entry 2011 - Reinvigorated waterways for transportation and sustainable development, Puerto Suárez, Bolivia: Matrix -propousal. Project entry 2011 - Reinvigorated waterways for transportation and sustainable development, Puerto Suárez, Bolivia: Port Suarez - Corumba: actual. 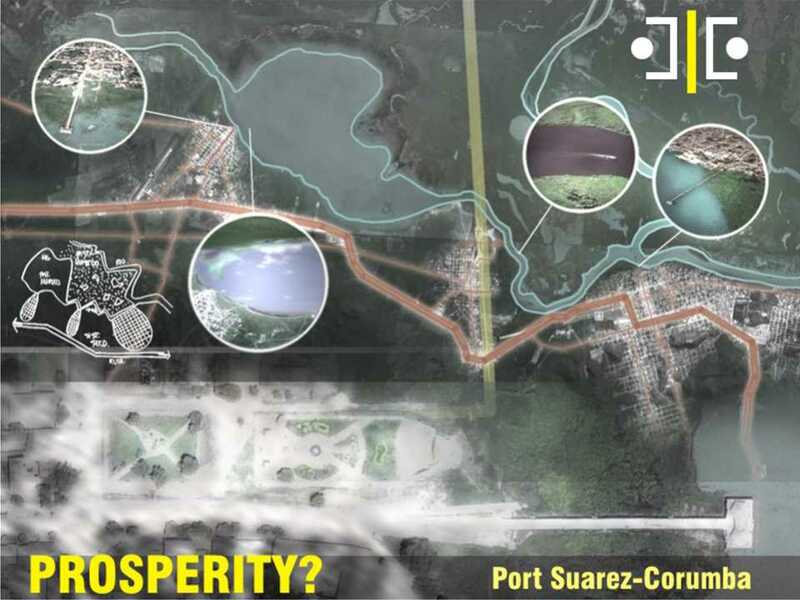 Project entry 2011 - Reinvigorated waterways for transportation and sustainable development, Puerto Suárez, Bolivia: Master plan. 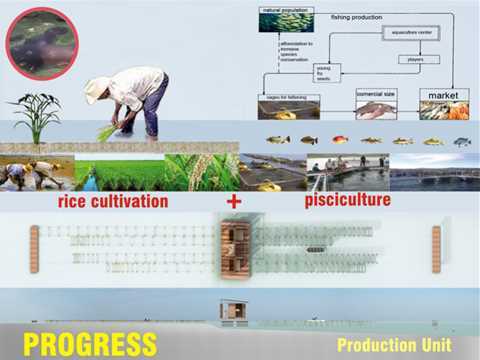 Project entry 2011 - Reinvigorated waterways for transportation and sustainable development, Puerto Suárez, Bolivia: Production unit. Project entry 2011 - Reinvigorated waterways for transportation and sustainable development, Puerto Suárez, Bolivia: Market and education. Project entry 2011 - Reinvigorated waterways for transportation and sustainable development, Puerto Suárez, Bolivia: Production unit and living. 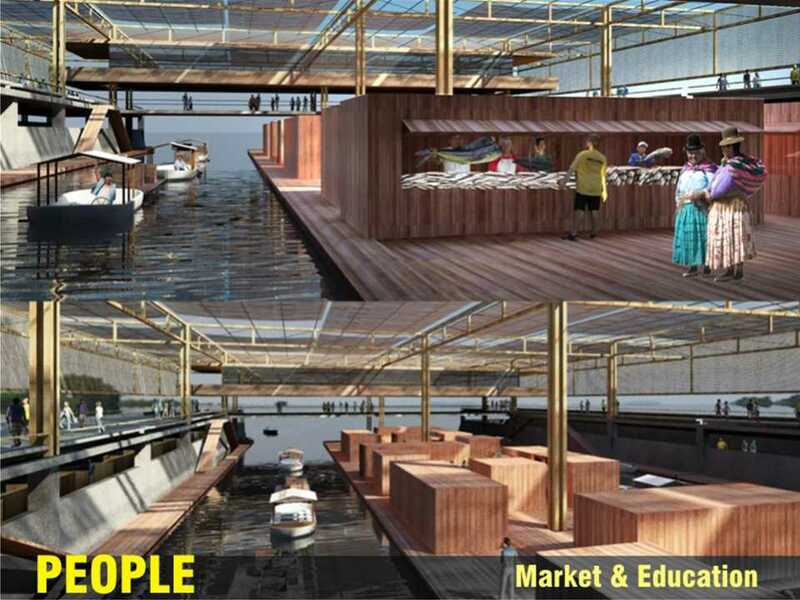 Project entry 2011 - Reinvigorated waterways for transportation and sustainable development, Puerto Suárez, Bolivia: Author picture. The project is designed for the UNESCO World Heritage listed Pantanal Conservation Area, a complex landscape encompassing 200,000 square km of lakes, rivers and wetlands in the border area between Bolivia, Brazil and Paraguay. 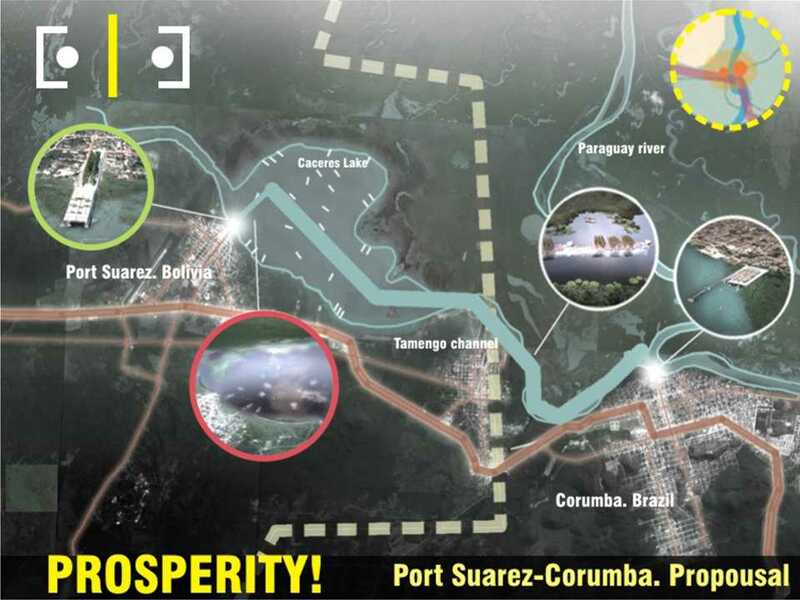 The strategic importance of the area for the South American interior is identified, both through an investigation of its potential as a transportation route between the ocean harbors and the inland. 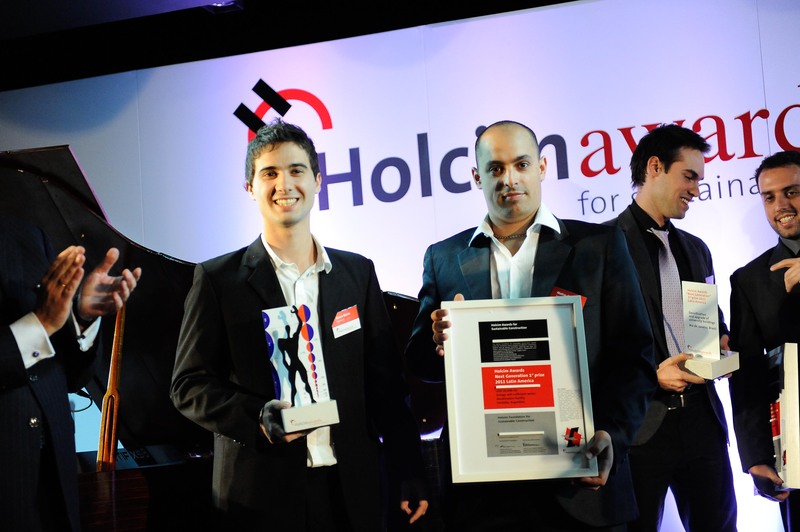 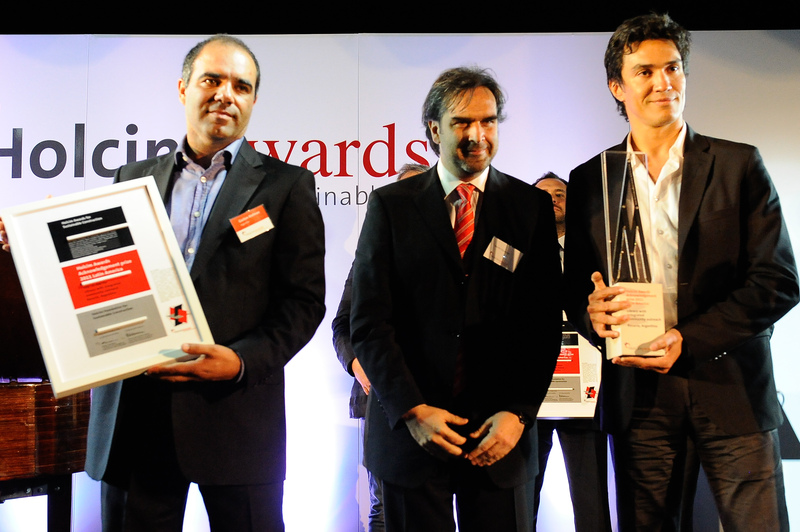 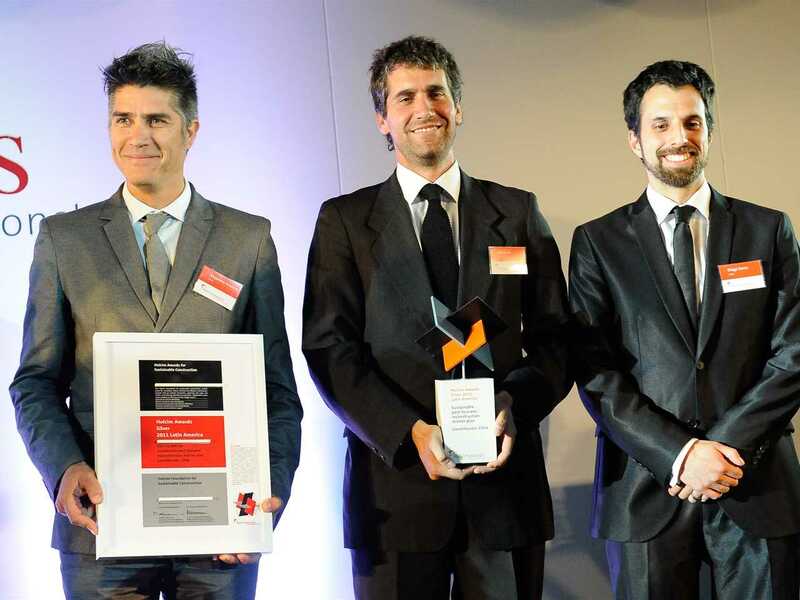 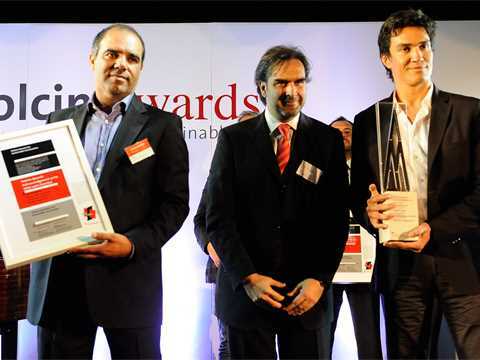 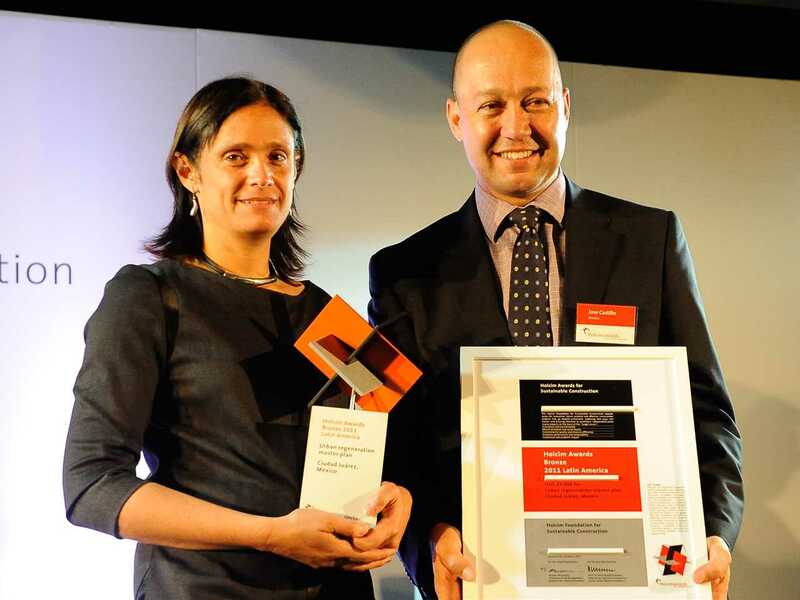 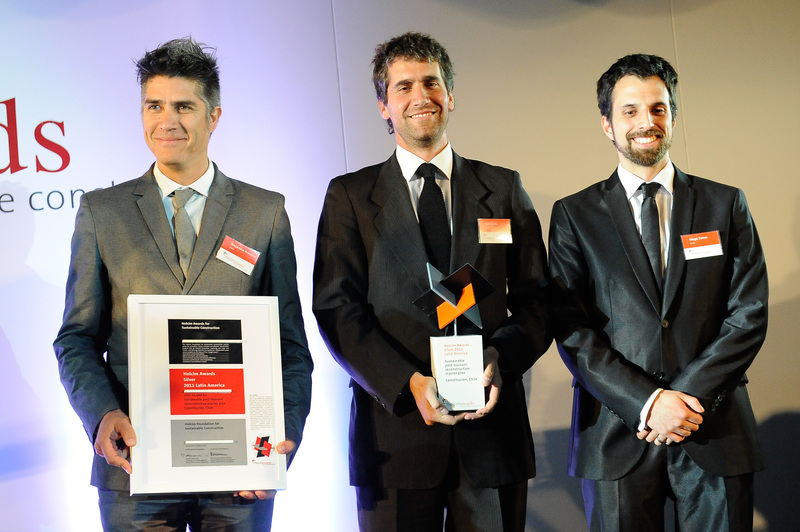 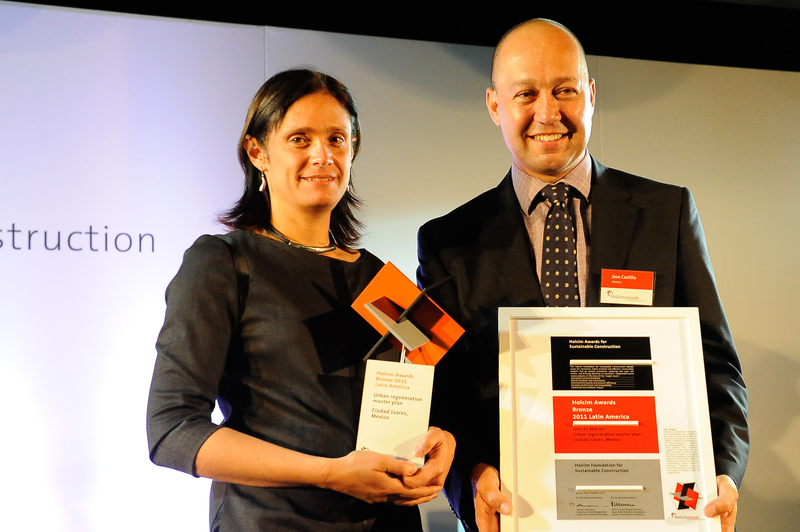 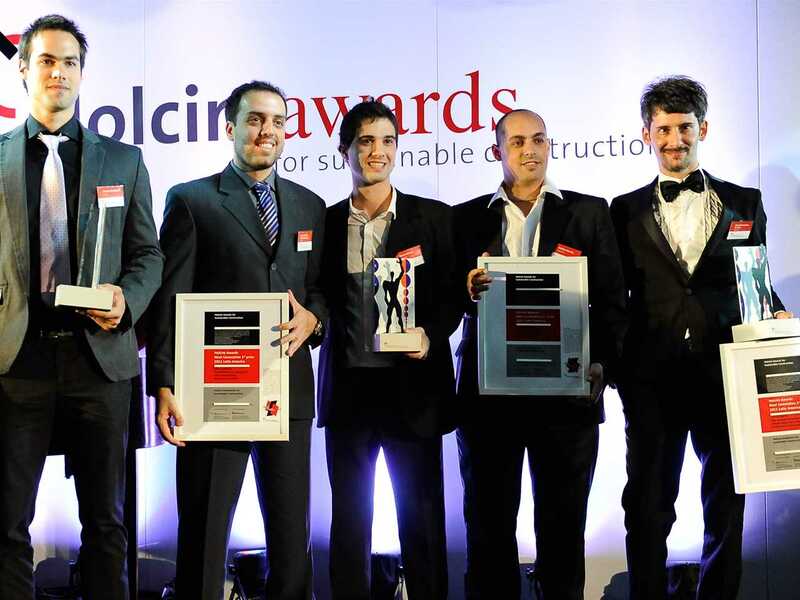 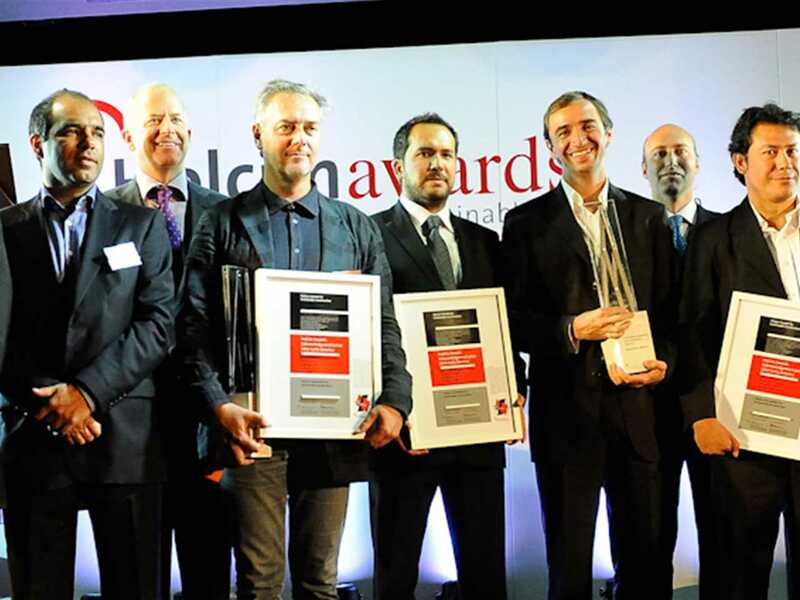 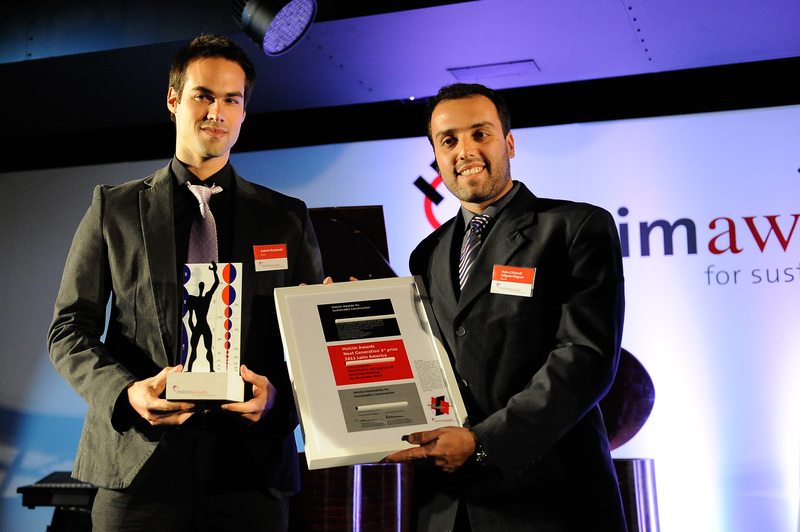 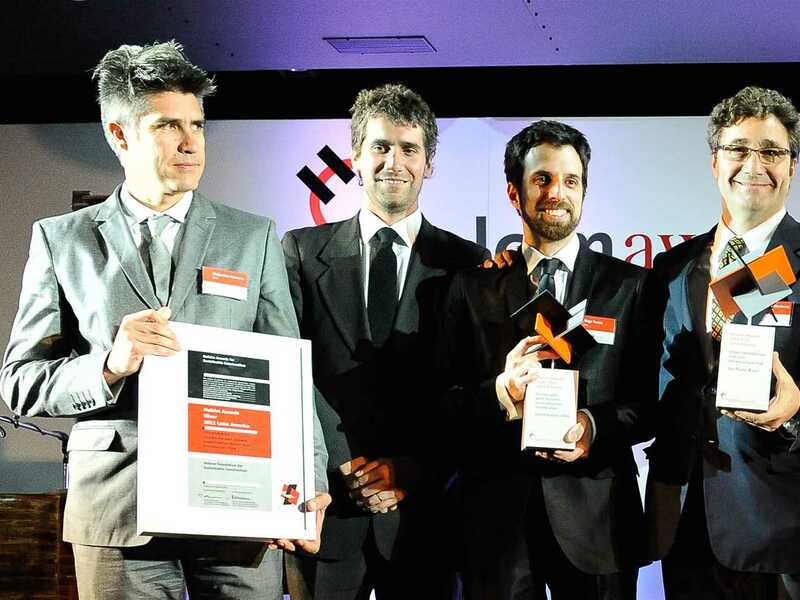 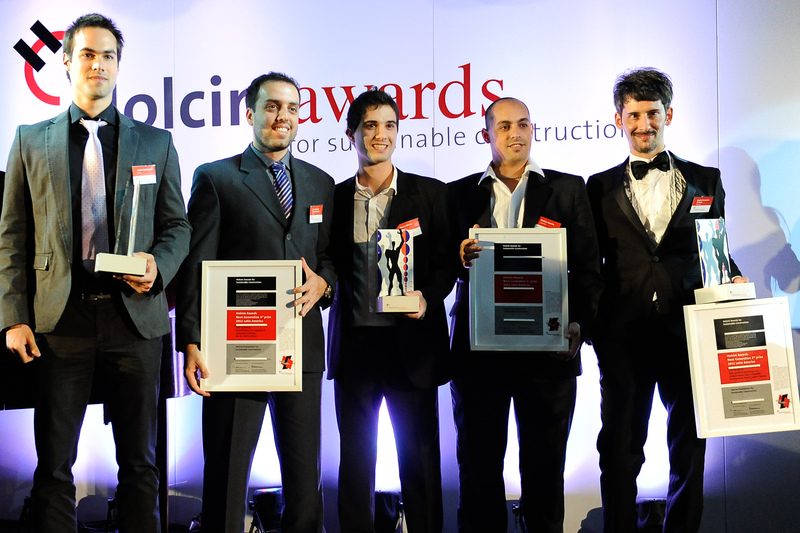 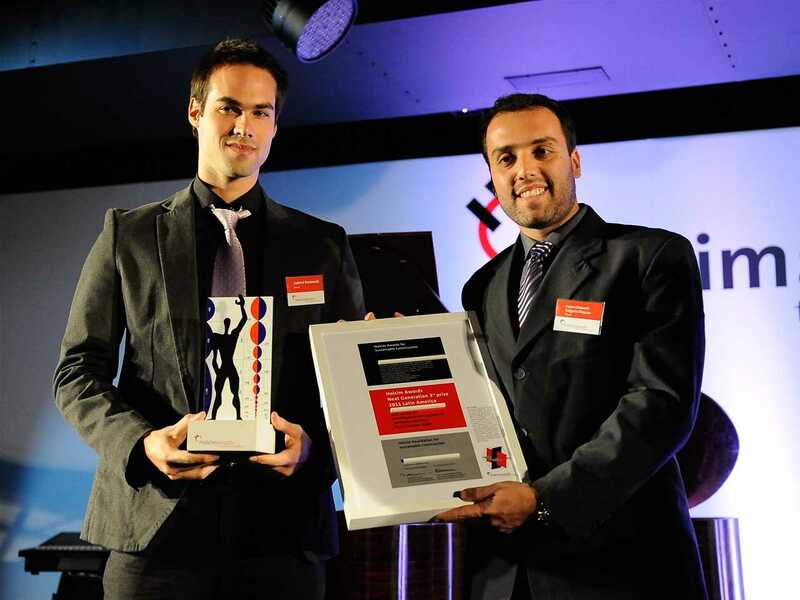 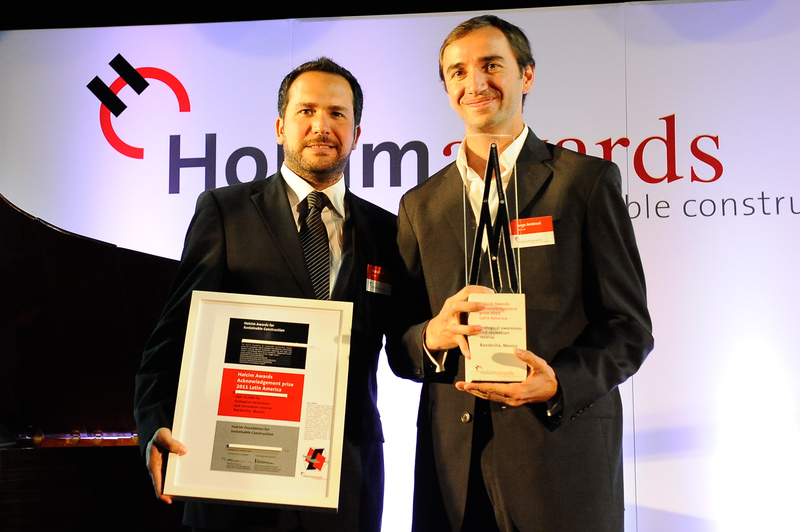 Holcim Awards Silver 2011 Latin America for "Sustainable post-tsunami reconstruction master plan", Constitución, Chile. Prize presentation (l-r): Carolyn Aguilar, Head of Jury and Dean of Architecture, Universidad Iberoamericana (UIA); Markus Akermann, CEO, Holcim Ltd; winners Alejandro Aravena, Juan Cerda and Diego Torres of ELEMENTAL S.A. 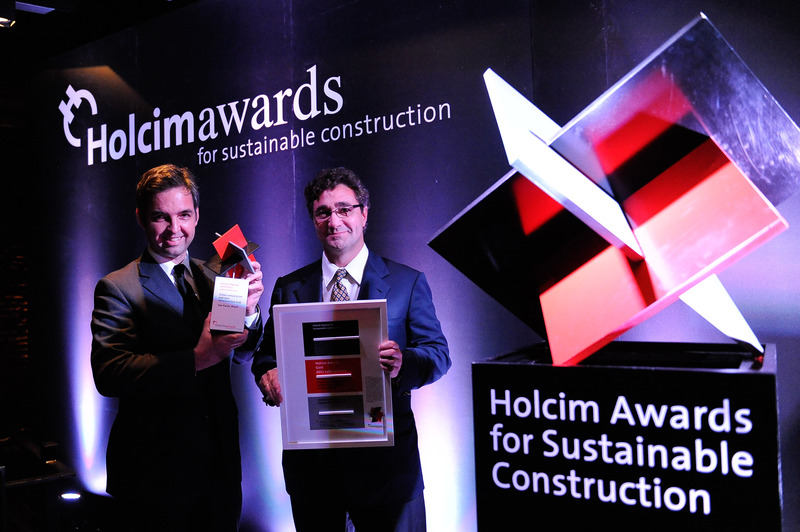 Winner of the Holcim Awards Acknowledgement prize 2011 Latin America for Recovery of the rail transport network, Oaxaca Valley, Mexico (l-r): Gustavo Madrid Vazquez, espacio entre tiempo Architects, Mexico with Master of Ceremonies, Andrea Frigerio. 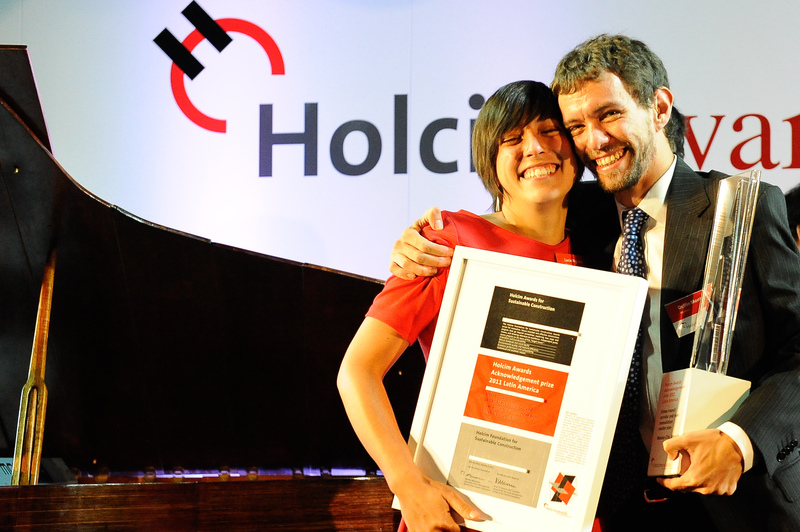 Members of the Holcim Awards Acknowledgement prize 2011 Latin America winning team for Urban transit corridor and river remediation master plan, Mexico City, Mexico (l-r): Lucie Nguyen and Delfin Montañana, Taller13 Arquitectura Regenerativa, Mexico. 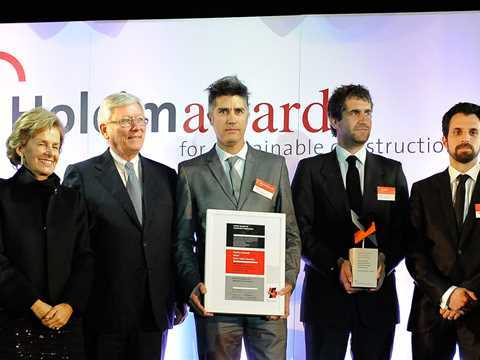 Mathias Klotz, Klotz y asociados ltda, Chile, winner of the Holcim Awards Acknowledgement prize 2011 Latin America for Green university library, Santiago, Chile. 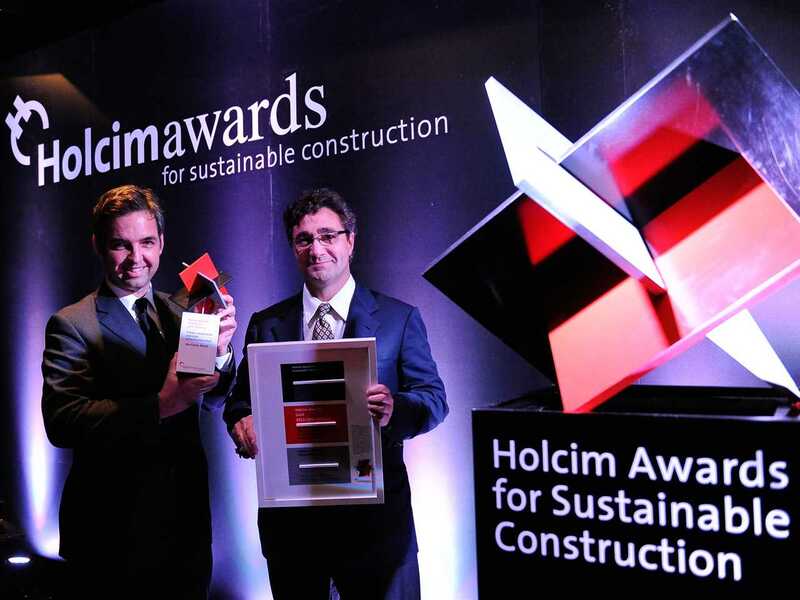 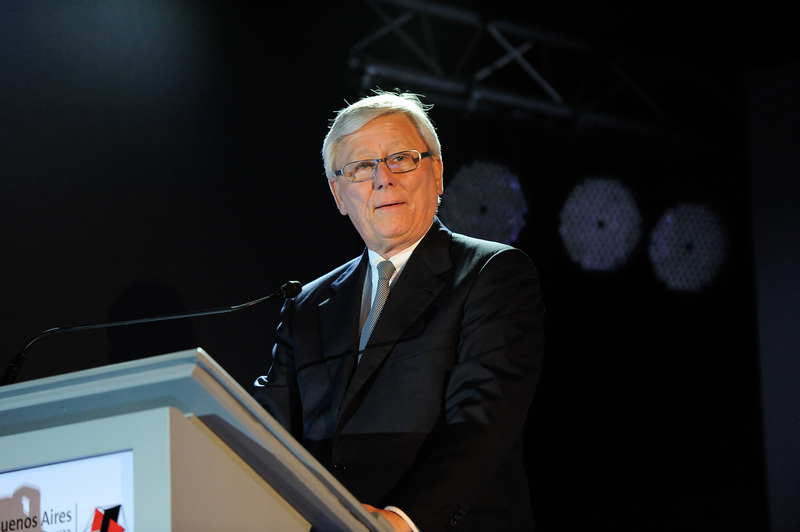 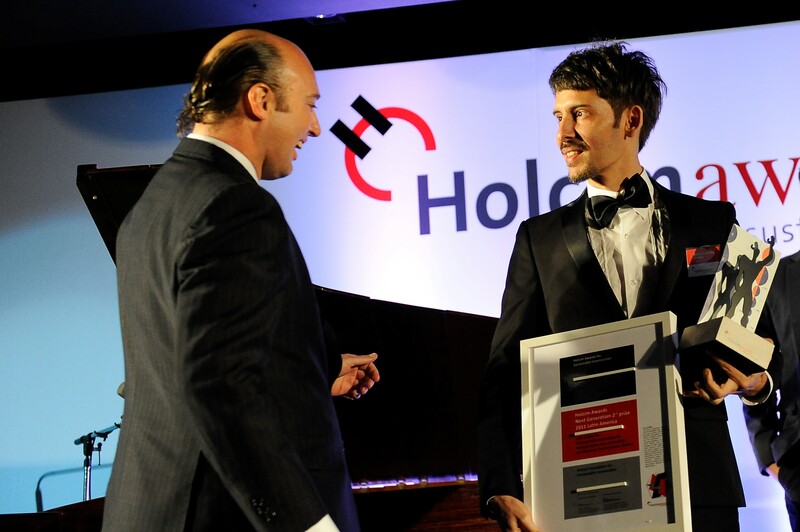 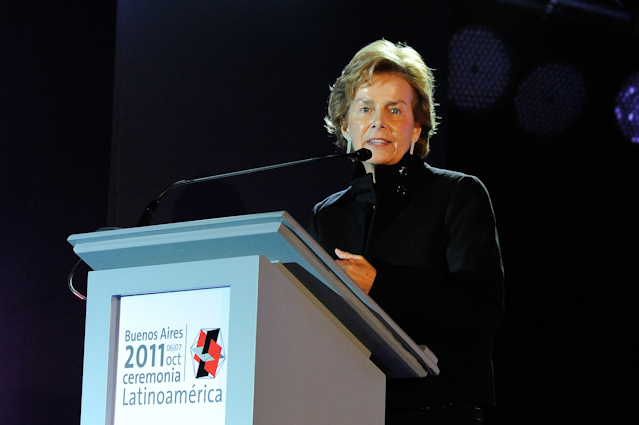 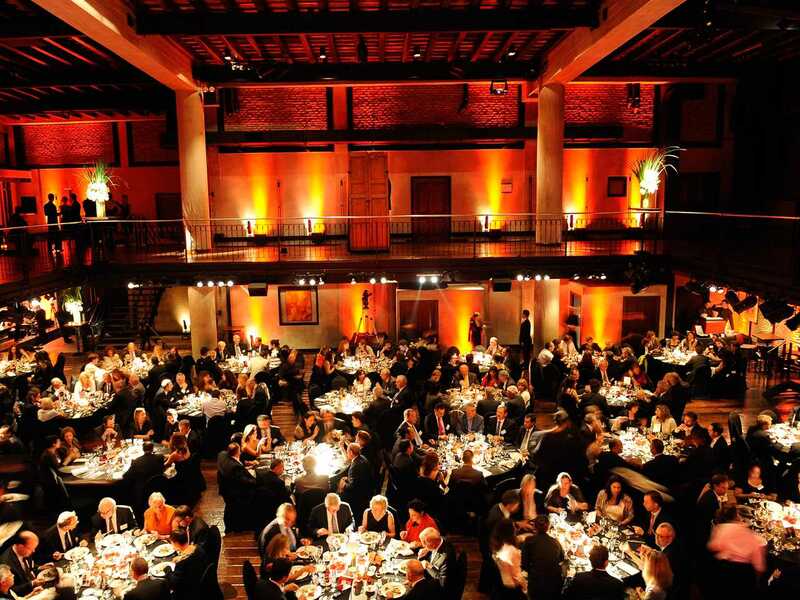 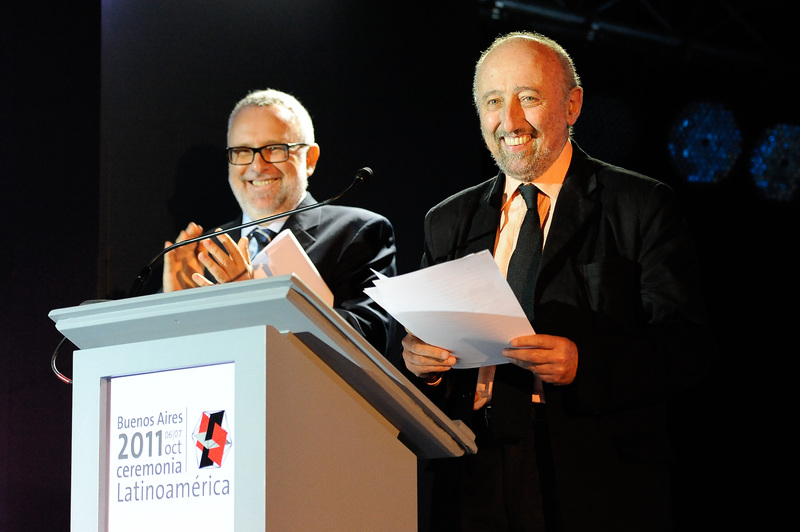 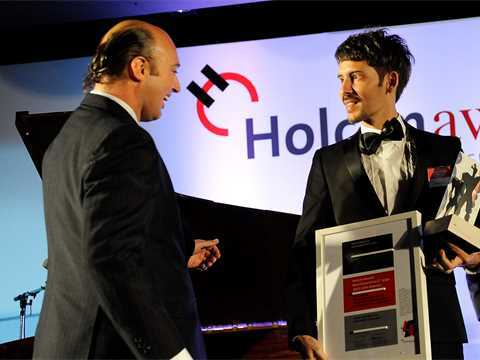 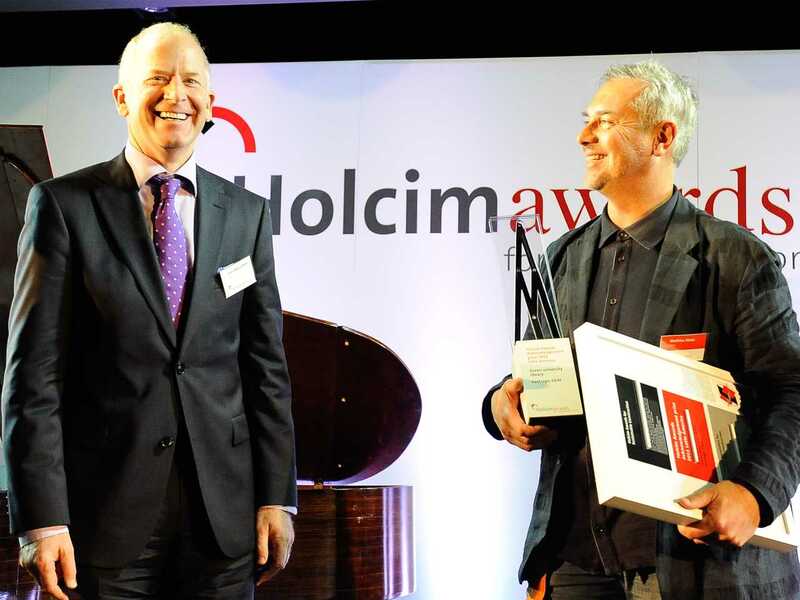 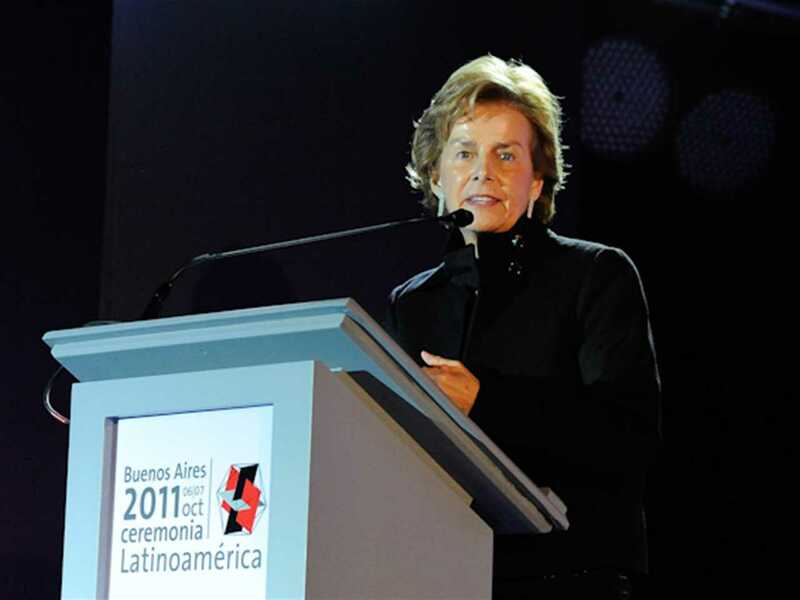 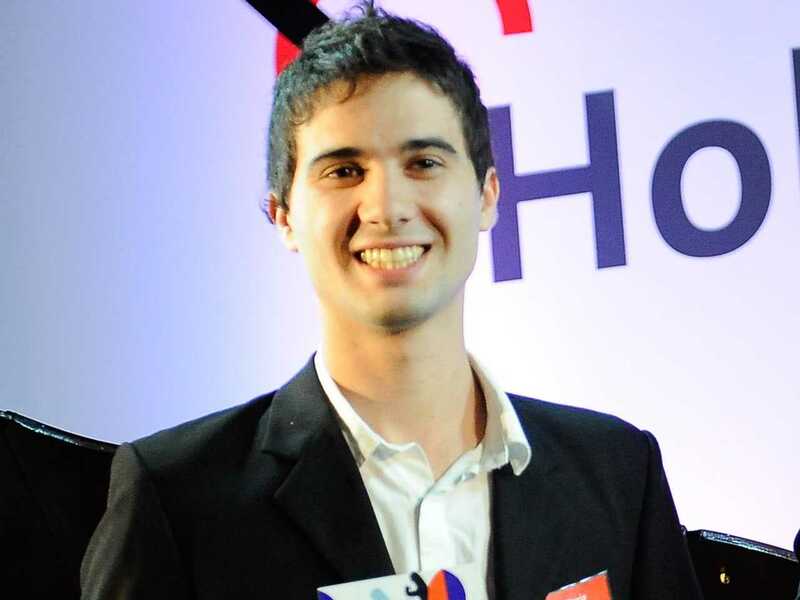 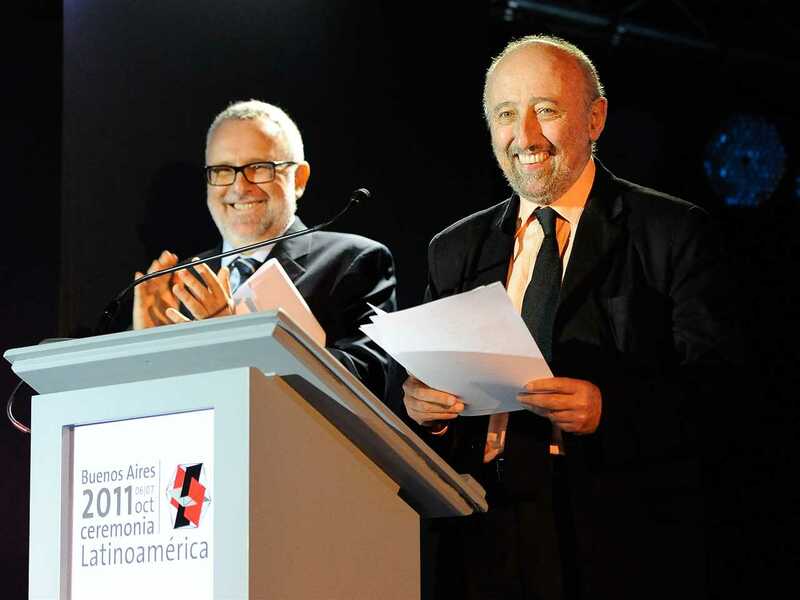 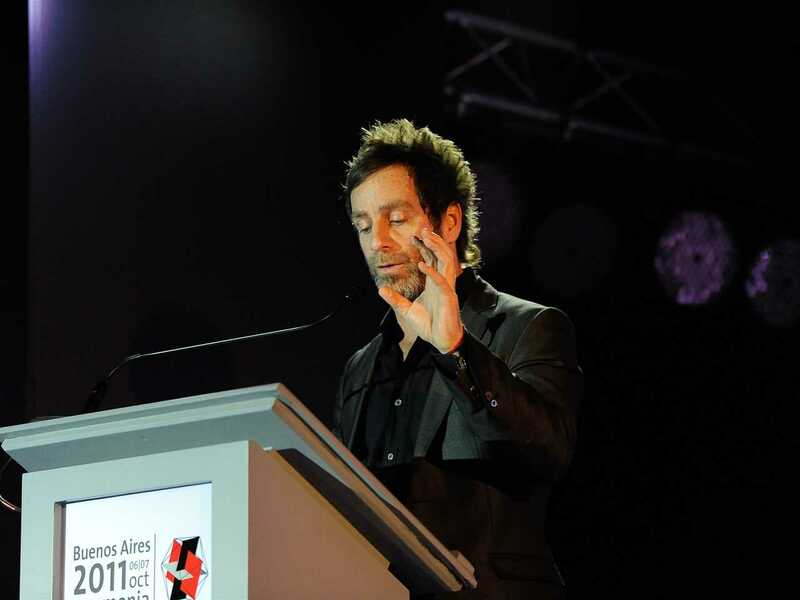 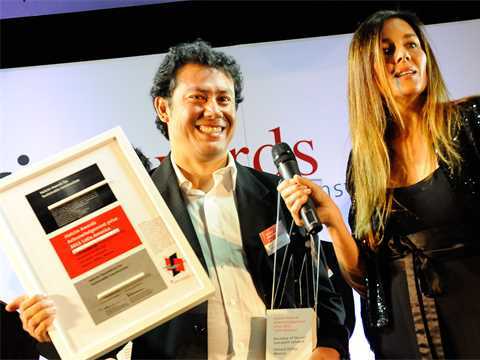 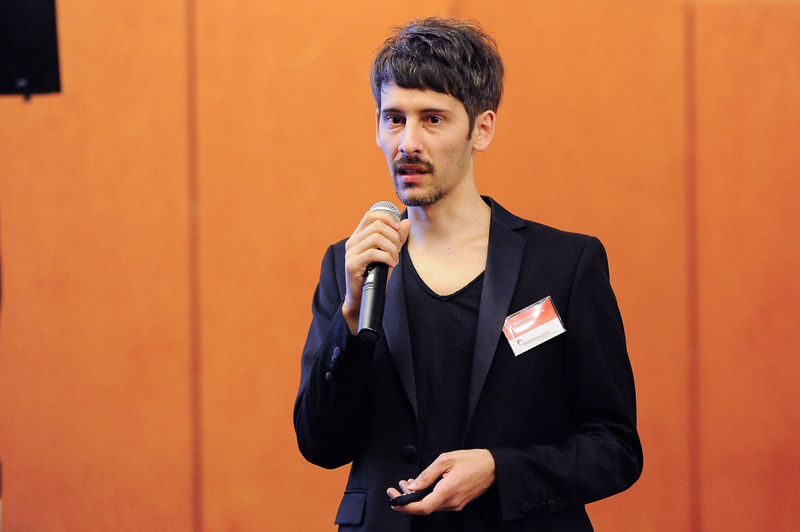 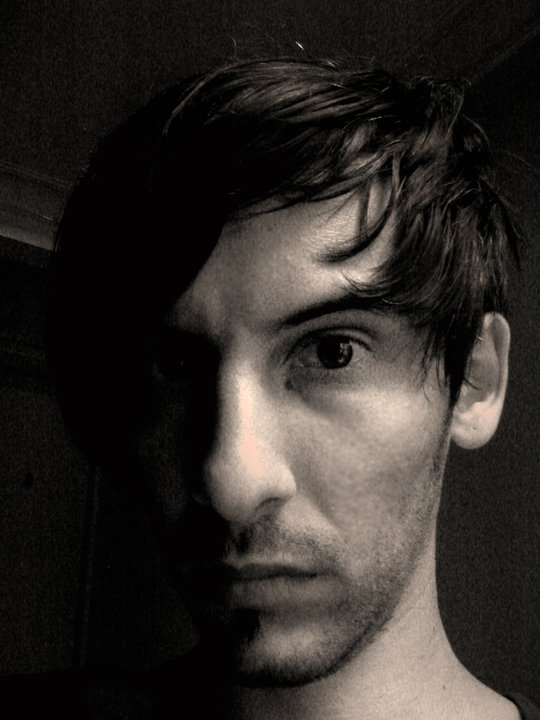 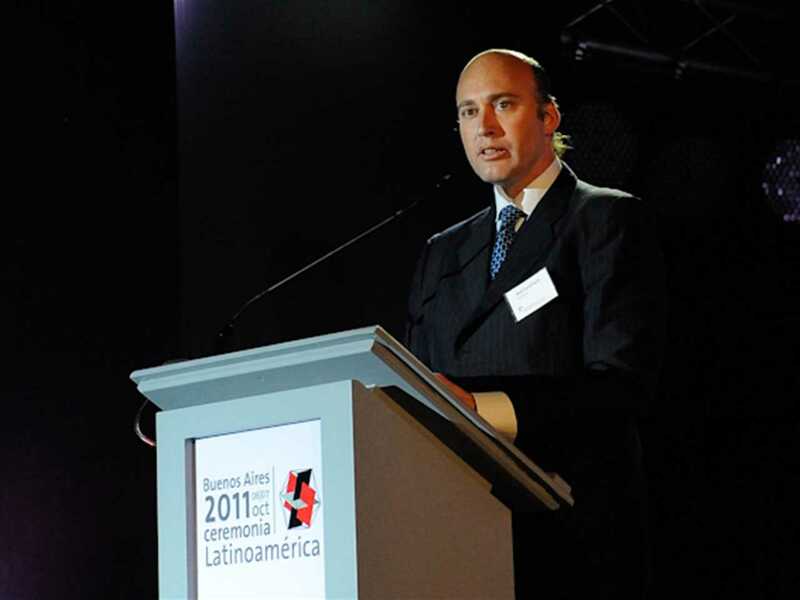 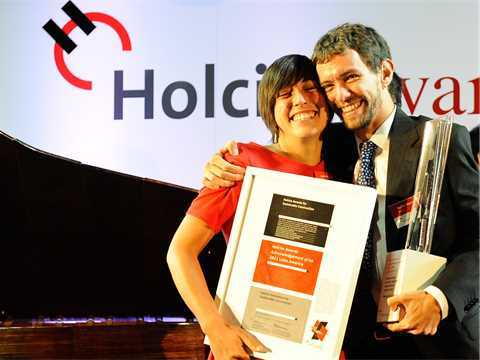 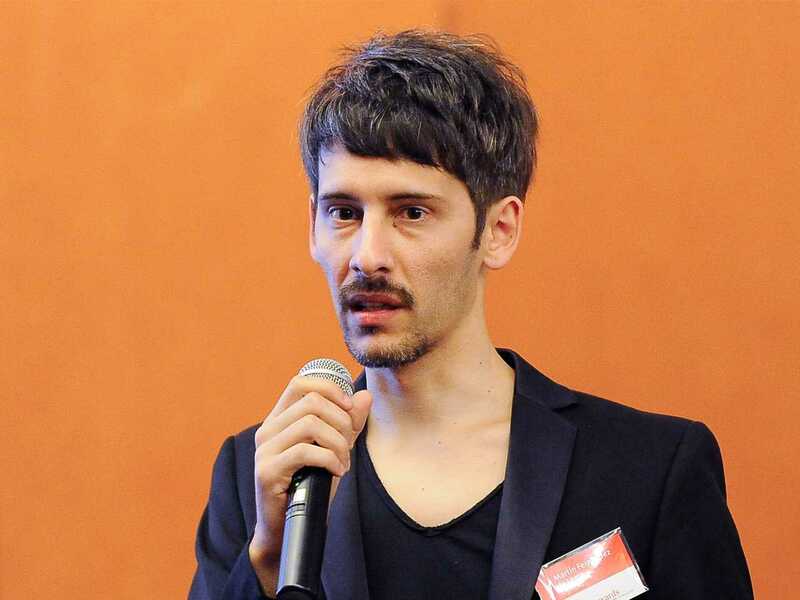 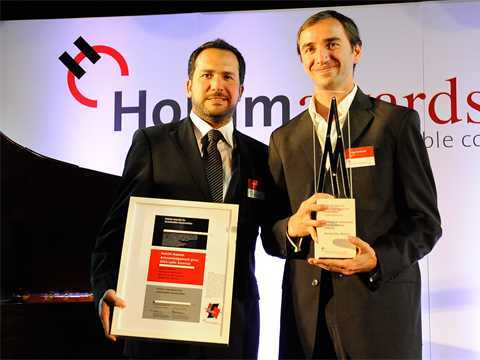 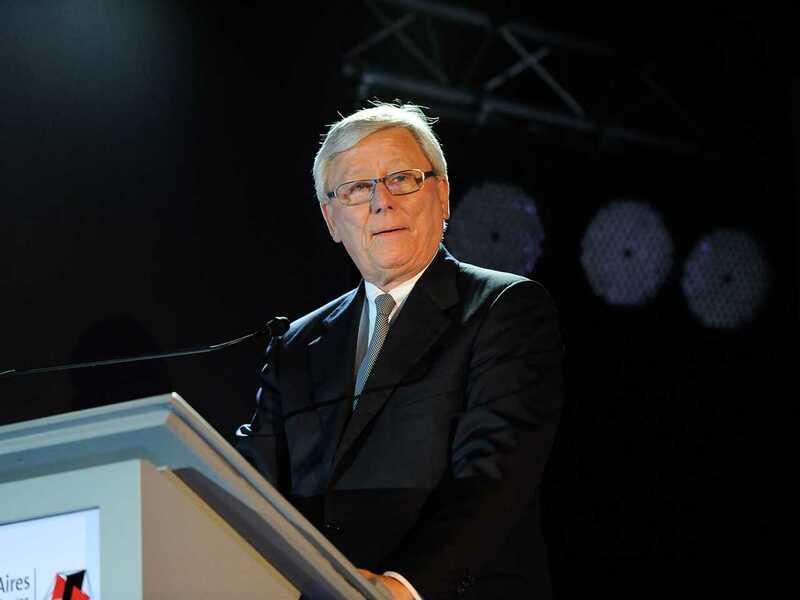 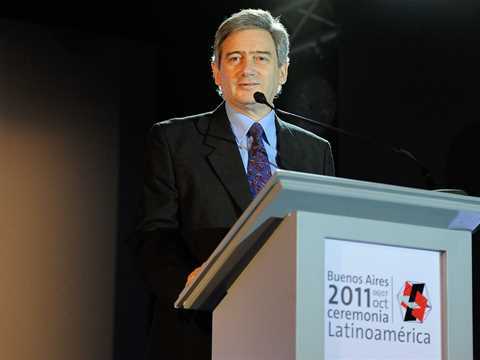 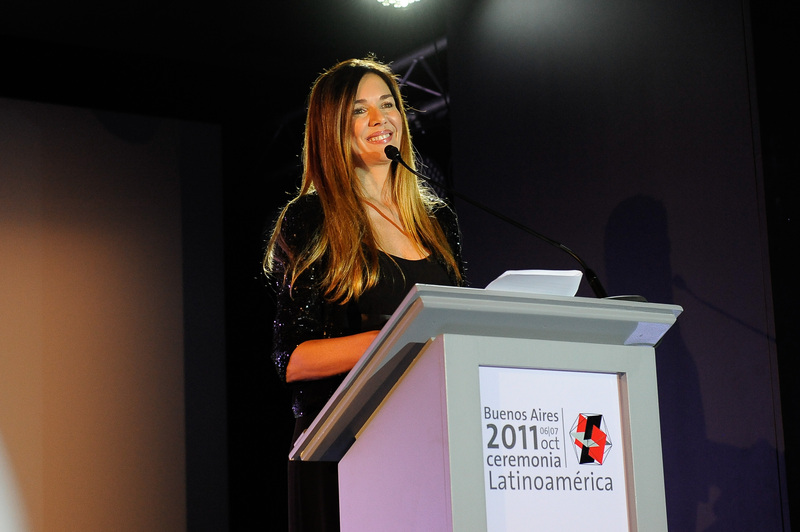 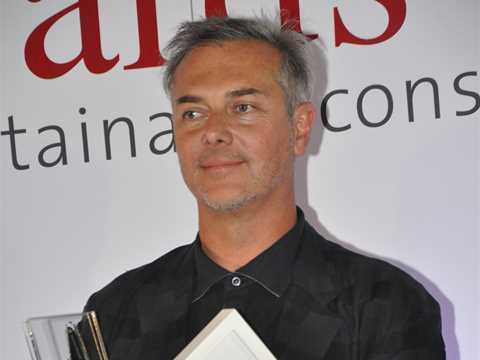 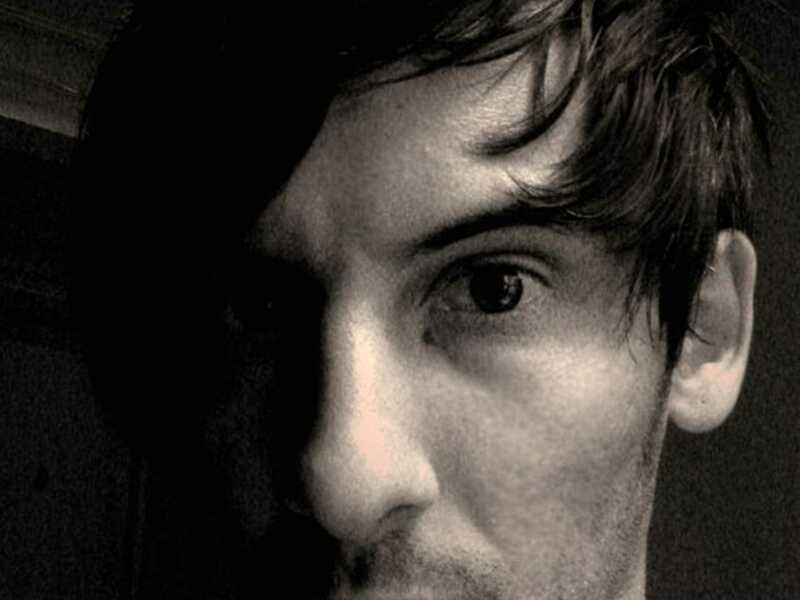 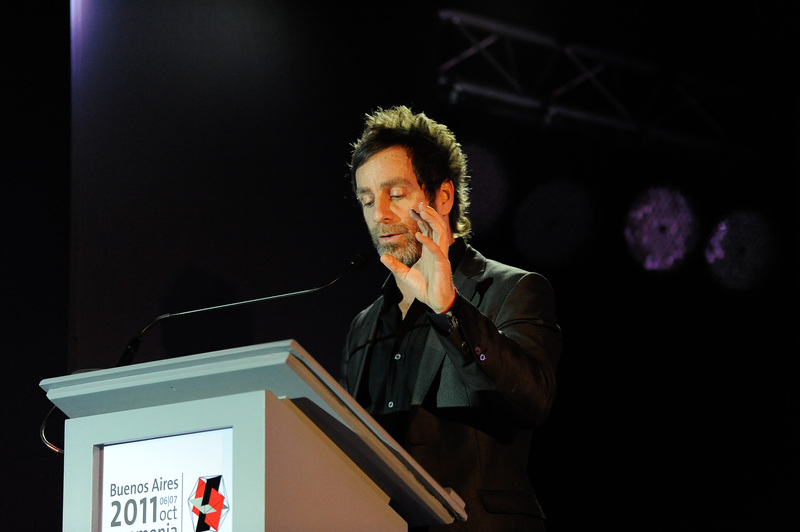 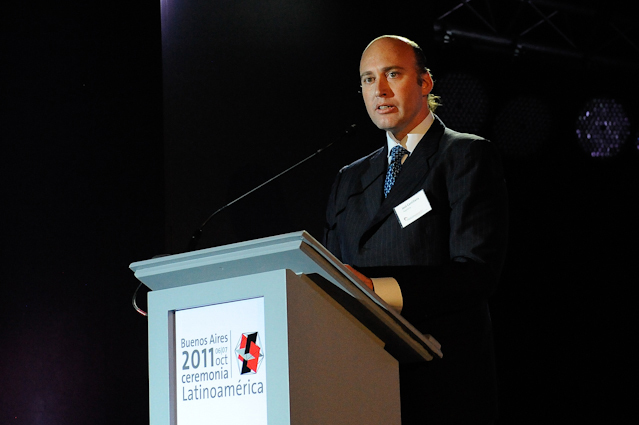 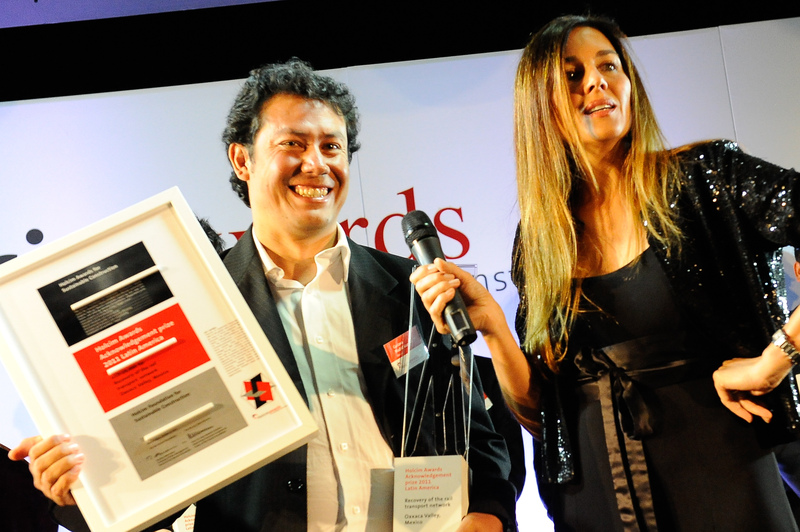 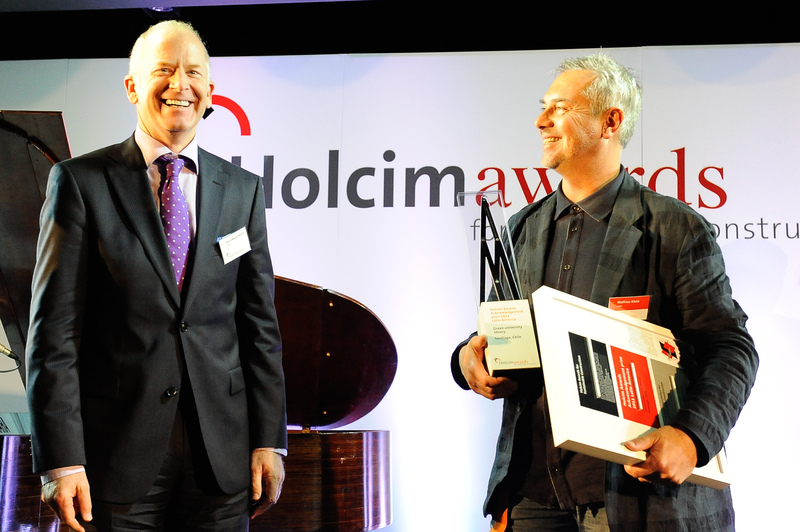 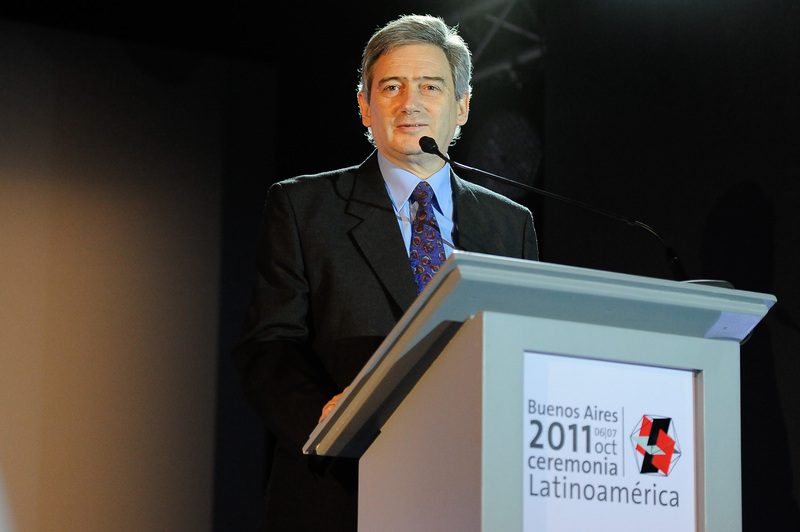 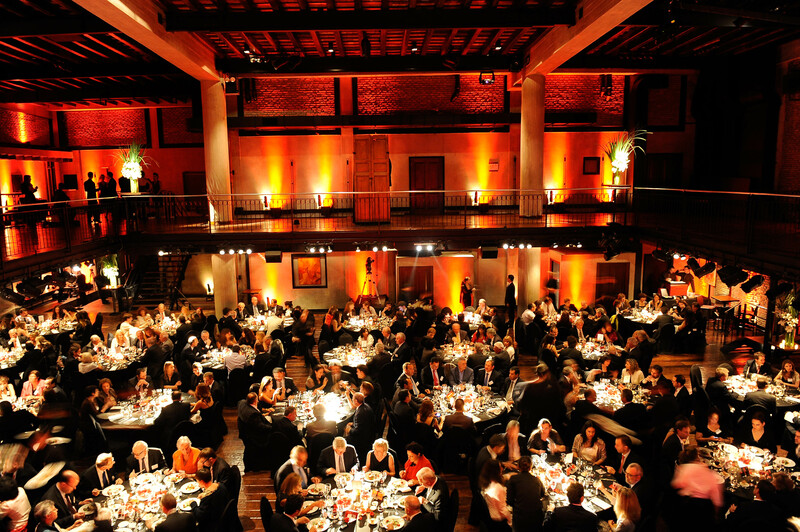 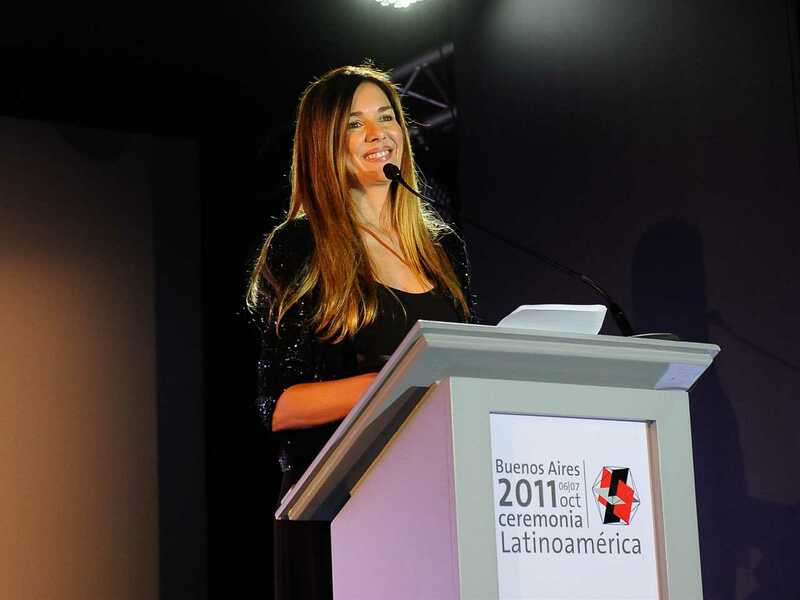 Architect, Pablo Beitía – keynote address at the Holcim Awards 2011 Latin America ceremony. 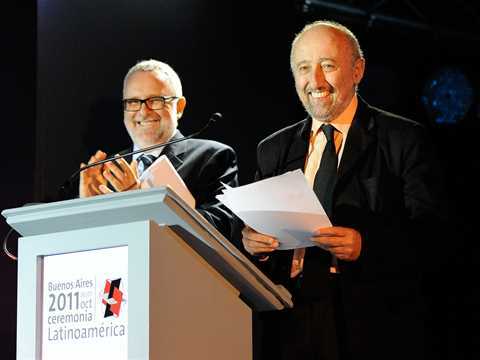 Michel Rojkind, Design Principal, Rojkind Arquitectos, Mexico City, Mexico and member of the Holcim Awards 2011 Latin America jury – presentation of the “Next Generation” prizes. 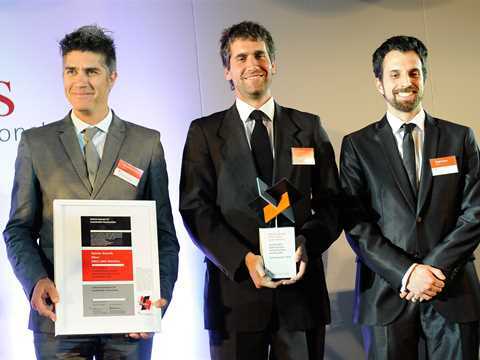 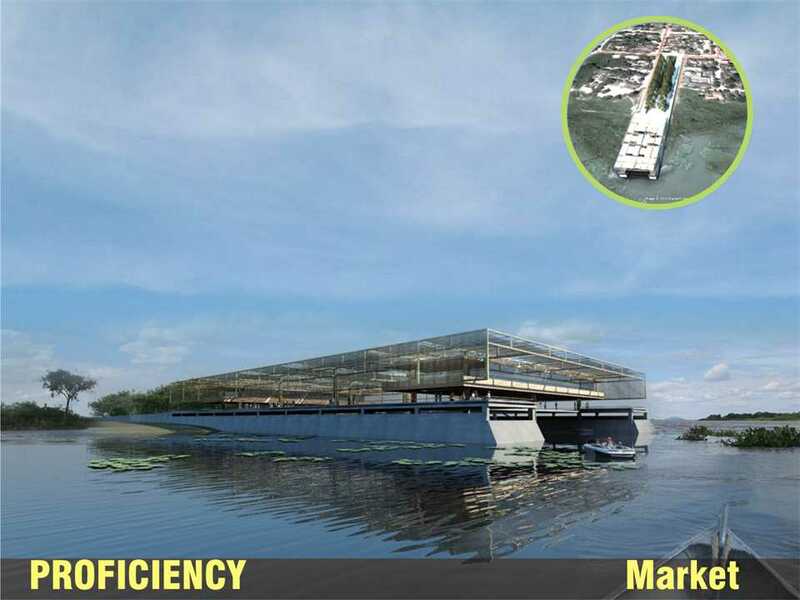 A proposal to reinvigorate waterways for transportation and sustainable development in Puerto Suárez, Bolivia, by Martin Fernández de Lema of the Universidad de Buenos Aires (UBA), Argentina received the Holcim Awards “Next Generation” second prize. The jury commended the project for its holistic approach from large scale to micro-level details such as social issues; and its realistic approach to a transnational project. Within that, the integrated thinking of the production-market-education line and the social impact are particularly important contributors to the quality of the project. 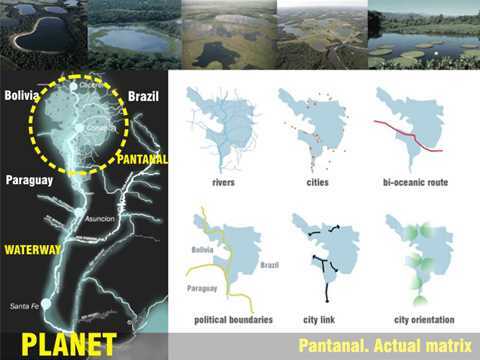 The project is designed for the UNESCO World Heritage listed Pantanal Conservation Area, a complex landscape encompassing 200,000 square km of lakes, rivers and wetlands in the border area between Bolivia, Brazil and Paraguay. The strategic importance of the area for the South American interior is identified, both through an investigation of its potential as a transportation route between the ocean harbors and the inland, and as living space for those who have limited options to develop their livelihood. 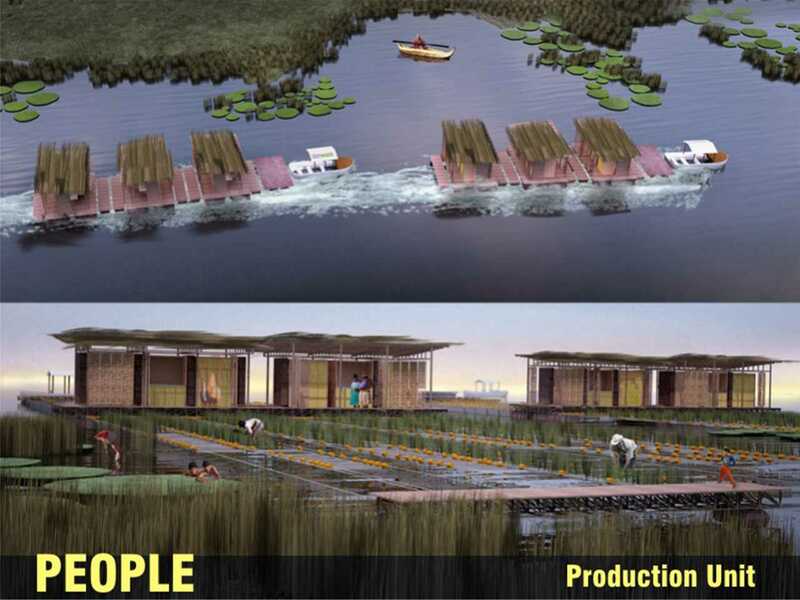 As a starting point, Interior South explores the potential to harness the water, which floods up to 80% of the land area during the wet season. 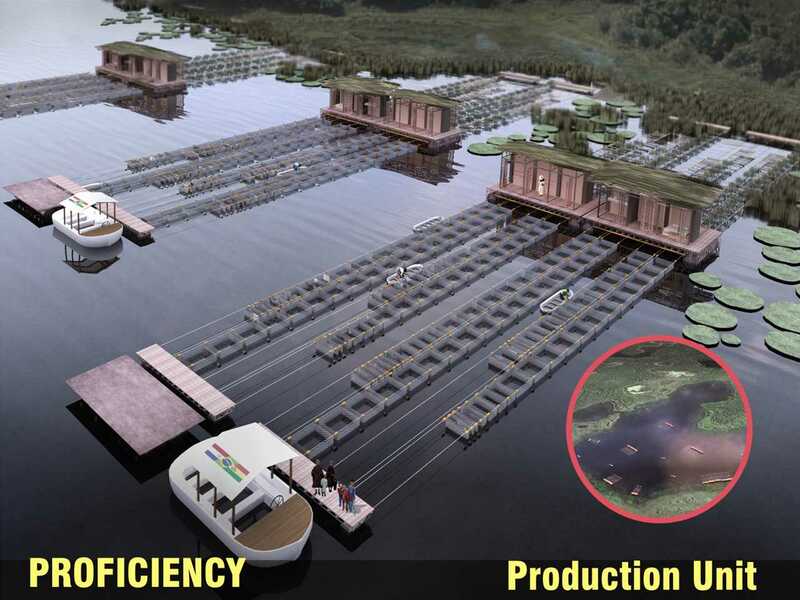 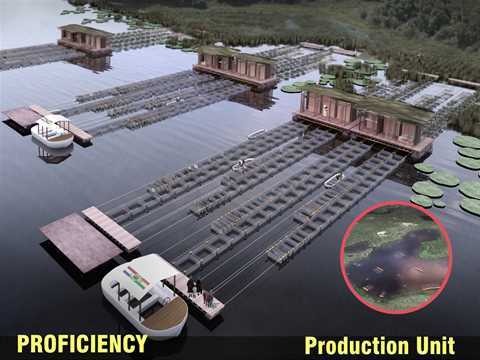 Then, core elements are proposed, serving as floating units for production, living, trading and teaching. The project explores the possibility of harnessing the potential of water as a condition of the interior of South American continent. The aquatic environment becomes the factor that links the cities of the region, and is also the new production environment for the natives. The bioremediation as a method of filtering gray water, and productive environment and excellence are utilized and reinterpreted in this proposal.